Elizabeth de Lacey was a full-time pupil at the Royal Ballet School from the age of nine, where she also studied the piano. At the age of eighteen she graduated into the Royal Ballet Company, where she danced solo roles whilst still a member of the corps de ballet. Her career as a dancer was cut short by injury, but she was awarded a place at the Royal College of Music, where she completed a three year performing course in piano and singing. Choral singing has always been a great love, and Elizabeth was for many years a regular singer with Holst Singers, also acting, for a time, as Artistic Producer for the group, in which capacity she was instrumental in organising a series of concerts of Russian choral music which culminated in the disc IKON. Elizabeth has studied with Peter Stark, Alan Hazeldine and Jason Lai. She has also participated in masterclasses with David Lawrence, Julian Wilkins, Sian Edwards, Paul Sarcich and Vladimir Ponkin. 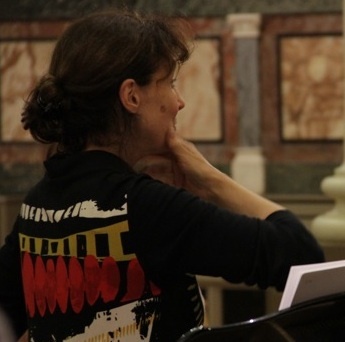 She is Conductor and Musical Director of Skolia, which she formed in 2003.